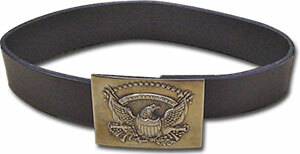 Leather belt with buckle Compliment the authenticity of your buckle by adding a handmade belt. Our belts are hand-cut and dyed from leather we select by hand for quality and appearance. Choose the belt color that is best for you: Military Black or Russet Brown†. Our belts come in 1" (25 mm), 1 ¼" (32 mm), 1 ½" (38 mm) or 1 ¾" (44 mm) widths. The belts are made to fit Three-hook and Modern buckle backs. Be sure to include your accurate waist size. Note: 1 ½" (38 mm) is the standard belt loop width on most modern pants including jeans. Please be sure to purchase the correct width. All of our products are handmade in Virginia. Choose a Width 1" 1 ¼" 1 ½" 1 ¾"
†Because our belts are hand dyed their will be some variation in the actual belt colors. The samples above are for reference only. *Parsley's Brass is not responsible for belts cut to the wrong size if we are given the wrong waist size. All of our products are made by hand using traditional methods of the 1800’s Each piece is cast and finished individually. To ensure the highest quality this process cannot be rushed. In many cases the products you order will be cast specifically for you. We understand in today's world that this is not the norm but we promise it will be worth the wait. In the continental US allow 15 days to receive your order. International orders take longer and the delivery times vary.